ProgeSOFT unveils progeCAD 2019 Professional, the new major release of a general-purpose 2D/3D DWG/DXF-native CAD. 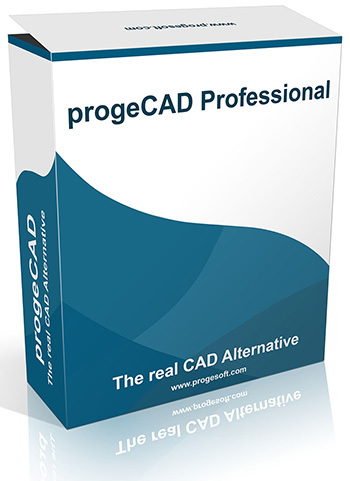 With DWG-native support, 2D/3D CAD capabilities, extra tools and plugins included for free, progeCAD 2019 is your best choice in alternative CAD software. ProgeSOFT is thrilled to announce the new release of progeCAD 2019 Professional, an affordable DWG CAD for professional drawing with perpetual licensing solutions. progeCAD continues to grow and the 2019 release addresses users' specific requirements to face their daily design chores like support for popular 3D CAD formats STEP and IGES, print without margins, the optimization for devices with 4K displays, viewport controls and many more. progeCAD Professional is the CAD platform which works in 2D and 3D directly with DWG and DXF files from AutoCAD® 2.5 to DWG 2018 ensuring full compatibility when exchanging DWG/DXF drawing files. Getting started with progeCAD is intuitive for users familiar with AutoCAD® thanks to the interface with Classic and Ribbon menus as well as commands and options quite like that of the industry standard. The new progeCAD 2019 version is released on the new IntelliCAD 8.4 engine and offers a series of new tools, commands and options, multiple new file formats support and numerous enhancements. The progeCAD 2019 performance has been improved for software startup time, entity snaps on underlays, drawings with XREFs, redrawing when creating and updating files with multiple entities as well as printing large drawings in the model space using the windowed print area selection. The User Interface optimizations include support for 4K monitors providing a sharp and crisp display of the menu items; the redesigned and rearranged menus for quicker access to commands, viewport controls to save time reaching views and visual styles, and the new CUI editor for an easier interface customization. Now progeCAD 2019 can import and export acad.cui and acad.pgp files allowing CAD professionals to utilize their AutoCAD® aliases. ·Import/Export of numerous new file formats allowing to exchange multi-discipline information-rich models like STEP, IGES, Maya .MA, 3D Studio .3ds, Wavefront .OBJ just to name a few (please visit the official website to learn the whole list of new supported formats). ·IFC Underlays with building and construction data. The IFCPANE command is added to open the Objects categories panel in order to control visibility. Once the .ifc underlay is attached, it is possible to snap to its entities or explode it converting into editable CAD data. ·Plot Margin Customization, allowing to edit plotters/printers standard paper size margins and get borderless prints. The Previous Print Area visualization is also supported by the Print Command. FAST TRIANGULATION of point clouds. Creation of TIN surfaces from the points of point cloud scan files or land survey collected points. The AUTOSEZ command can be applied to these surfaces. AUTOSEZ. The tool for the automatic creation of surface profiles to show surface elevations along a horizontal alignment to represent, for example, road edges or ditches (Topographic Sections). SLOPE. The tool for an easy creation of terrain slope lines (ticks) between two edges or for a conversion of polylines into slope-style polylines. ·Numbered Markers to automatically create bubbles with sequence numbers or letters. ·The AIDIMFLIPARROW command to flip the direction of arrowheads in Dimensions. ·More new commands in the Express Tools group: GETSEL, BSCALE, GATTE, QLATTACH, DIMDISASSOCIATE, PREFIXSUFFIX. ·Total Length Measure of selected entities: the properties palette displays the cumulative length of selected polylines and lines or the total area of several selected hatches. ·Line spacing, lists and paragraph justification in the In-place Multiline Text Editor. ·The new AutoCAD-like filter command with the dialog (‘_FILTER). ·Smart Search with priority to most frequently used commands and improved readability in AutoComplete. ·WMF optimized for BetterWMF for a better experience and fine quality when pasting and copying progeCAD drawings into other software packages like Microsoft Word. “ progeCAD is firmly established as one of the best alternative CAD solutions, a smart CAD package able to save your time and money. progeCAD is far more than a simple drawing tool, as it allows to better organize, automate and make your day-to-day design processes hassle free thanks to its extra tools included for free like 3D PDF export, the PDF to DWG converter, the Vectorizer, the Block Libraries Manager, BetterWMF Integration, the EasyArch plugin and the Artisan Render module. Even at today's blistering pace of technological change our solid basic CAD software always remains relevant,” commented Marco Lucini, CEO at ProgeSOFT SA. To learn all progeCAD 2019 new features, please refer to the official website and the dedicated YouTube Channel. Explore progeCAD 2019 in a 30-day fully-functional trial to get a complete picture of the new version potential. Download a trial version HERE. ProgeSOFT SA is a private software company which is specialized in cost-efficient CAD solutions. With large experience of operation in the CAD industry, ProgeSOFT offers the versatile CAD platforms for Windows and MAC and applications for architectural, mechanical, electrical, GIS, HVAC/Piping and some other industries. ProgeSOFT is also a founder and executive member of the IntelliCAD® Technology Consortium.